Every few years we take a step back to do a sort of heat-check on the Cleveland dining landscape. Our motivation is to survey the bounty that we have at our fingertips and call attention to the places that we’re excited about at this particular moment in time. Some of these restaurants make the roster year after year, while others are brand new to the scene, bumping colleagues off the list by their arrival. Whatever label you choose to bestow upon them – Best, Essential, Top Toque, Golden Spoon, Primo Piattos – the meaning is the same. These are the restaurants that stand out in a very crowded field for a variety of reasons, many of them intangible. When it’s time to answer that ubiquitous question of “Where should we eat?,” the answer very likely can be found below. There are restaurants that we enjoy and then there are restaurants that we can’t stay away from. 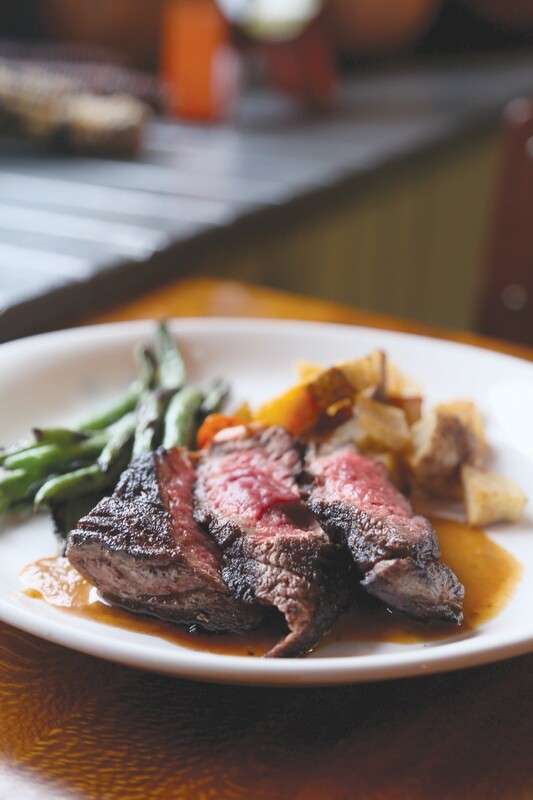 Mabel’s is one of the few Michael Symon restaurants that succeeds largely independent of the star chef’s renown. We go there not for the scene, but for the meat, amazingly savory, wood-kissed and consistent. Here, slow-smoked pork ribs, beef brisket, turkey and kielbasa act like siren songs to hungry carnivores. The logistics of feeding this many people this much great food aside, this bustling meat-and-bourbon hall always manages to exceed our lofty expectations. There seem to be fewer and fewer gimmick-free farm-to-table bistros, the types of places that simply do in place of try. For more than 20 years, chef-owner Doug Katz has weathered every conceivable trend, challenge and calamity in this unpredictable business, responding with an ever-steady hand on the wheel. Diners can always count on Fire to deliver reliably delicious food trimmed with seasonal foodstuffs and served by a professional staff in a crisp, cool setting. Fire’s sunny weekend brunch can make a morning person out of Rip Van Winkle. “Nobody orders small plates in Cleveland.” Since the birth of the turnip, that has been the conventional wisdom in these parts. Of course, at her whip-smart Lakewood bistro Salt, chef Jill Vedaa continues to upend that old saw by composing exceptional dishes that focus on a single theme. In place of a meat-and-three, diners zero in on carrots three ways, or earthy beets blasted with sparkle, or a savory lamb ragu over a few supple gnocchi. Mix and match your way to the perfect meal; variety, after all, is the spice of life. If you aren’t pleasing every Cleveland diner then you’re probably doing something right. This edgy American bistro is fearless when it comes to food, pushing out items that are so bold in conception that they can seem like a dare. But in the hands of chef Brett Sawyer, dishes like raw pork tartar or a whole fried chicken served General Tso style are revelatory, stunning and singular. Here, humble ingredients like beets and carrots or chicken skin and lake fish are transformed into artistic seasonal creations that manage to tickle as much as they do satisfy. It’s all presented in a sleek, contemporary interior by people who actually seem to care. And was that barbecued pigeon we spotted on the menu? Diners who settle in for a tasting menu at this wee Asian bistro will be taken for the ride of their lives. Chef Matthew Spinner’s obsessive take on regional Japanese cuisine is a deep dive with more twists and turns than a thrill ride. Enjoyed as part of a seven- or 13-course excursion, or on their own as a la carte appetizers, the dishes are stirring seasonal still-lifes that simultaneously embody home and away. For shabu-shabu fans, Ushabu excels thanks to high-caliber ingredients, top-notch technology and an impressive sake selection. Given that University Circle is the epicenter of Cleveland culture, you’d think it wouldn’t be so damned hard to find a great meal. Fortunately there’s this French-themed gem, the crown jewel of the Zack Bruell kingdom. While we could happily live on the wine and cheese alone, it’s nearly impossible to skip the garlicky snails, the mussels frites, and the textbook skate with browned butter. Do yourself a favor and order the pied de cochon, goosed with the silkiest béarnaise. What’s left to say about the service and setting other than they serve as polestars for others to pursue. Banter is the antidote to serious food in somber settings. It’s county fair food with a bowtie, where fries, sausages, and hotdogs are spruced up for a clever crowd. You won’t find a better corndog to drag through the mustard, and the crispy, melty fried cheese curds will vanish quicker than the Statue of Liberty at David Copperfield’s abracadabra. But most folks come for the poutine, and who can blame them. Perfect fries drip with rich gravies made with real stock, while pert cheese curds slowly weep into the mix. Banter’s tightly curated list of draft beer and wines by the glass is always on point. Places that keep the moving parts to a minimum generally have a leg up on those that complicate matters. Start with great broth, fresh noodles, and quality meats and you should wind up with a bowl of delicious ramen. That’s the formula here, where bowls of bouncy comfort are ladled up in a hip-enough storefront. Toss in a few knockout starters like crispy-spicy Korean fried chicken, supple steamed buns and delicate pork-filled dumplings, pair them with cold beer and sake, and you’ve made a fan of us. 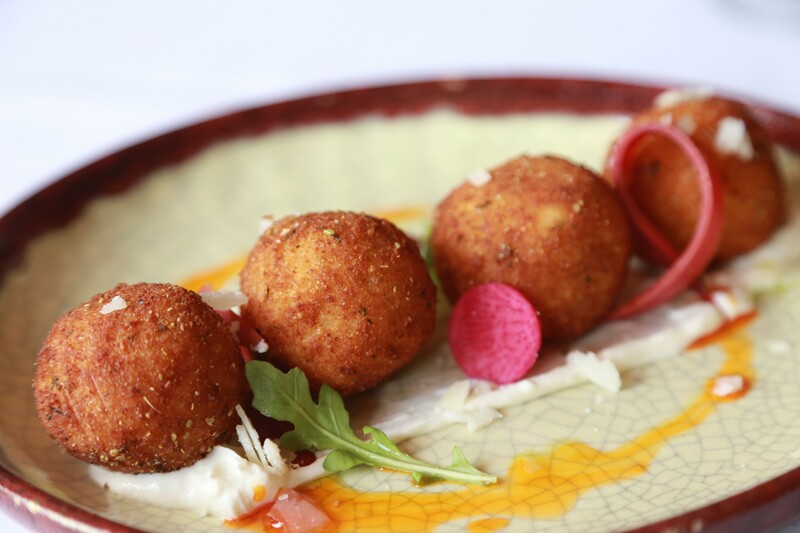 Despite what that one guy on Yelp said about the “bread,” we’re slightly obsessed with Zoma. We love the communal atmosphere of the experience, where diners sit around a platter of colorful, savory stews, pinching off bites with stretchy injera. Rare is the place that hungry vegetarians and omnivores can so peaceably coexist thanks to items starring chopped greens, chickpeas, lentils, beef and chicken. The housemade Ethiopian hot sauce, fueled by an exotic berbere spice blend, is righteous. Il Rione might be “just a neighborhood pizza parlor,” but it elevates the genre thanks to warm lighting, stylishly weathered interior, and a killer playlist from the golden age of rock. While the menu is spare, the New York/New Jersey style pizza exiting the open kitchen is amazing, with the clam pie taking the cake. Diners can choose from a half-dozen predesigned pies or can build their own from the crust up. Beer, wine, and cocktails round out the fun. At its heart, Larder is a Jewish deli, with matzo ball soup, thick pastrami sandwiches, and flaky fruit-filled rugelach. But there’s so much more going on here than that. Chef-owner Jeremy Umansky utilizes techniques like koji (a Japanese mold) curing, foraging for wild edibles, cold and hot smoking, and fermentation and pickling to produce an ever-shifting roster of seasonal plates. On special might be a house-smoked whitefish salad sandwich, wild-cherry blintzes, or chicken of the woods mushroom “pastrami” sandwich. Neighbors already have worn a path to its door for house-baked loaves, chocolate-swirled babka, dark and chewy chocolate chip cookies, and flaky potato knishes. 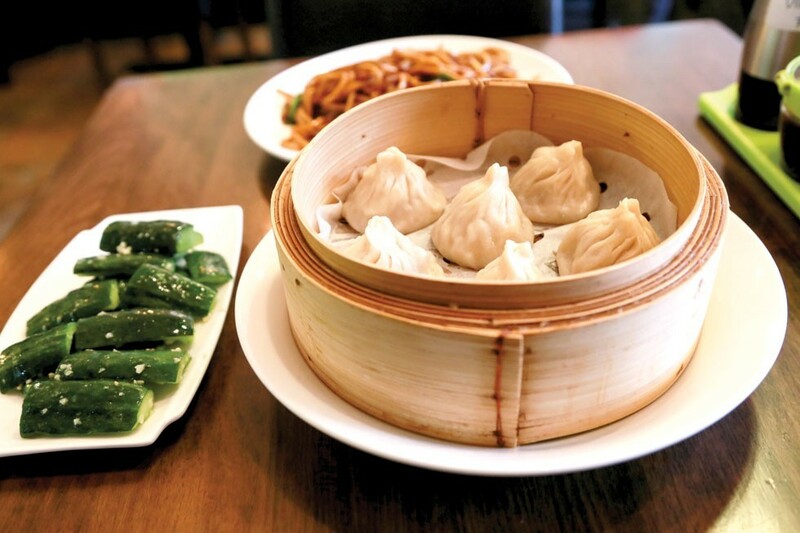 LJ Shanghai, a relative newcomer in Cleveland’s Asiatown neighborhood, has been absolutely besieged by diners who recognize quality xiao long bao—or soup dumplings—when they see and taste them. We’ve been making habitual pit stops for those amazing dumplings, but also the growing roster of satisfying soup, noodle, and meat dishes. Tops in our book is the plump shrimp wonton soup, spicy beef noodle soup, Shanghai-style scallion noodles, and soy-braised duck. It might just be pizza to us, but to owner Marc-Aurele Buholzer, it’s a way of life. First you make the dough, then you stoke the fire, and finally you feed the neighborhood. There’s only so much of that naturally leavened dough to go around, so admiring diners know to get here early to secure one or three of those fly pies. They exit the wood-burner with a textbook puffy, chewy, tender crust spotted like a leopard with slightly bitter bits of char. Those bits provide the perfect foil to the sweet, rich Milk ‘n Honey pie topped with garlic, mozzarella, egg and bit o’ honey. Is it just us or does Flour get better and buzzier over time? We’ve been fans of the Italian restaurant since the start, lured out to suburbia by the four skilled hands belonging to Paul Minnillo and Matt Mytro. This tag team of tagliatelle put the panache back in pasta, elevating the genre from dependable gut-buster to captivating, elegant cuisine. The perfect pairings of noodles and sauce, like rigatoni with lamb neck gravy, are memorable to the very last bite. Throw in a fistful of creative starters, crisply tailored pizzas, and a great steak and fish dish and what else does one need (apart from a stellar wine list, which is covered)? It was right around the time our server wheeled a cart up to the table that we regretted not inviting more friends to dinner. Our combination platter had enough beef short rib, ribeye, pork and chicken to feed half the dining room. But we persevered, cooking up tasty bits of Korean BBQ on Rising Grill’s trusty new gas-powered grill tables. Hot off the grate, we bundled up the charred, garlicky pieces of meat into cold lettuce wraps, dragged them through sauce, popped them in our mouths, and washed them down with ice-cold OB beer. We never stood a chance, but at least we went out with a smile. The seafood-in-a-bag trend rolled into town with a bang, with three spots devoted to the concept opening in a few short years. You don’t have to explain why to the diners who crowd this small, boisterous storefront by the Cedar Lee Theatre. Digging your hands deep into a bag of spicy, saucy steamed seafood might be the most fun one can legally have in a restaurant. The aptly named Handful is a Santa-sized sack filled with shrimp, crawfish, clams, andouille sausage, corn and spuds, all lolling about in a mouthwatering gravy. Over the years, the Greenhouse Tavern has always come through for us as the Swiss Army Knife of restaurants. Few places have the culinary range to span the bridge between every day and special occasion, from burger-and-beer-at-the-bar to blow-your-mind at the chef’s counter. It’s always tough to veer away from chestnuts like hand-ground steak tartar, Ohio lamb burger with “stinky cheese,” Animal-style frites and Tabasco fried chicken. But we do so in order to find new favorites like the summery salads, seasonal pastas and special seafood dishes that will vanish before we can return. Talk about underappreciated. When Balaton opened a half-century ago on Buckeye Road, the primary language spoken in the dining room was Hungarian. But word of the modest restaurant’s remarkable goulash, Weiner schnitzel, and paprikash wriggled out, at first to the immediate neighborhood, and later to the city and region as a whole. Come to the lovely restaurant at Shaker Square, where Balaton has now resided for 20 years, and you won’t be awash in Old World shtick. Instead, you’ll enjoy expertly prepared dishes like that Frisbee-sized schnitzel, and golden-brown fried chicken livers, and portly stuffed cabbages, and gravy-soaked spaetzle, all of it lovingly handmade to order and sold well below market value. Mega-restaurateur Zack Bruell has a bushel of restaurants around the city, and this one isn’t even our favorite. But that doesn’t mean we don’t adore being down here by the river, soaking up the history of the 150-year-old brick building in the Flats while enjoying riotously flavorful food and beer. The sprawling menu is hard to pin down, but can’t miss items include wood-fired pizzas, lamb tamales, fish tacos, Moroccan-spiced lamb ribs, and burgers. Tack on a flight of the house-brewed beer and watch the freighters and kayaks float by. Ben Bebenroth is regarded as one of the region’s leading farm-to-table chefs for good reason. He puts his money where his mouth is when it comes to sourcing food by managing a working farm just south of town. While the dishes change with the calendar, diners can count on options built around local produce, pork, chicken, and beef and sustainable fish and seafood. The cheery, flower-trimmed Detroit Shoreway bistro makes weekend brunch all the better. If Soho literally served nothing but chicken and whiskey as its name suggests, we would totally be down with that. What more do you need when the fried chicken is this good and the bourbon list is this long? But wait, there’s more! Meals start with airy biscuits, butter and jam. Stellar snacks like deviled eggs and pimiento cheese and chips are required eating. And to go with that magical, crackle-crusted yardbird are Southern suppers like shrimp and grits and the always frog-free Frogmore Stew. If you can handle the heat, shower on Soho’s famous hot sauce. As Ohio City continues to change at hyper-speed, we’re increasingly grateful for Karen Small and her unpretentious bistro. While concise, the locally sourced seasonal menus offer enough variety for everybody at the table, and that includes the vegetarians. Fresh, creative salads, savory small plates, meaty mains and just the right kiss of dessert is all a diner ever requires. For 20 years, the happy hour has remained one of the best in the biz, and summer sidewalk dining along picturesque Market Avenue is the epitome of urban chic. Nora upends the Little Italy stereotype of the spag-and-ball joint by applying classic French technique to Italian ingredients to come up with dishes that are in synch with the season, if not the surrounding restaurants. While you won’t be dabbing red sauce off your shirt, you will be awash in the Old World charm that attracts us to the Hill in the first place. Beneath a pressed-tin ceiling and behind a wall of windows, diners dig into creamy burrata, crunchy polenta fries, wild mushroom stuffed agnolotti, and fettucine carbonara topped with crispy matchstick potatoes and a buttery poached egg. Because pho is an essential part of a balanced diet, not to mention one’s sanity, noodle shops like this one hold a very important place in our lives. Winter or summer, a bowl of pho is more than food; it’s a restorative elixir that sets us on a brighter path. Crispy spring rolls, citrusy cabbage salad, and meaty banh mi sammies also make us happy, so it’s a good thing that the versions served at this perfectly acceptable dining room are as delicious as the noodle soup. A wise man once said, “If the sushi is cheap, run.” That sounds like solid advice given the logistics of flying fresh fish around the globe. Since opening this edgy Asian den beneath his eponymous bistro, Dante Boccuzzi has avoided shortcuts and cost-cutting measures in the pursuit of crafting the city’s best sushi experience. Grab seats at horseshoe-shaped bar and dig into spotless sashimi, sushi, and rolls. The kickass room makes everybody feel like a rock star and the astute staffers always help unearth the perfect bottle of sake.